Broken screen? I guess. Rebooting hasn’t helped. Plastic is in perfect condition, and the unit wasn’t dropped or mistreated in any way. Walt Mossberg, in his Wall Street Journal review, also mentioned issues with the display; notably unevenness in the text. 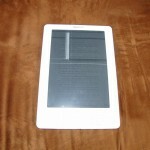 I love my Kindle 2 and haven’t even considered the larger one. This one fits in my purse and easily goes with me everywhere, and I mean EVERYWHERE! Love it! I bought my sister in-law a Kindle, I have a Kindle 2 and My mother-in law has the dx. We have all three come to the conclusion that the K2 is the better of the three and they both wish they had gotten a K2. I doubt there will ever be a need for me to upgrade to another kindle edition. Have an Iphone or Ipod touch? Get Kindle for Ipod for free and you can read any of the books available for the Kindle on your Iphone/Ipod touch. It links to your Amazon account and books are delivered in seconds. 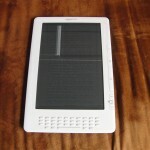 Yea, it’s a small screen, but it’s also $360 -$460 less than buying a Kindle. And for that much money, I can deal with that! No problem!! My Kindle 2 also refused to reboot although I did not drop or spill anything on my Kindle. I brought a protective cover and a skin for my Kindle. At the time it malfunctioned it was 4 months old. Apparently Kindle 2 crashes quite a bit. There is no explanation for this defect in the screen design. Sorry to hear about the Kindle problems. My husband researched both the Kindle and Sony PRS for my Christmas present last year. He chose the Sony. Sounds like he chose correctly. Its reader screen casing is metal and comes with a nice heavy (but not too heavy) durable leather cover. I have accidentally dropped it and it still works. Not a single problem. Its screen size is the same as the K2 as well is the price. I have read over 80 books on it since I received it for Christmas in 2008. I would suggest the Sony for anyone looking for a portable reading system. It also downloads photos and music and fits in my purse and is great for plane trips.